Bradycardia is defined by the American Heart Association as a heart rate of less than 60 beats per minute (BPM) but adds that what’s “too slow” depends on various factors such as age, physical fitness and physiological condition. During sleep for example, the parasympathetic tone predominates (as NREM sleep occupies 80% of total sleep time), resulting in commonly occurring bradyarrythmias, sinus pauses greater than 2 seconds, and atrioventricular (AV) conduction delays. However, some cases of nocturnal bradyarrythmias are not normal, and reflect acute bradycardia that is prevalent also in wakefulness and can lead to various hazardous complications. Obstructive Sleep Apnea (OSA) was found to be a promoting factor for such incidences. Numerous studies have demonstrated increased prevalence of bradyarrytmias in OSA patients; In the classic study by Guilleminault et al1 who looked at 400 patients with OSA, 48% had significant nocturnal arrhythmia with 18% bradyarrhythmia, 11% sinus arrest, and 8% AV blocks. These percentiles were surprisingly high, considering that the known prevalence of nocturnal bradyarrythmias in the general population was around 3%2. There were no important differences in age, body weight, apnea-hypopnea index (AHI), or minimum oxygen saturation between those with and without arrhythmias. In a more recent Japanese study by Abe et al3, 1350 OSA patients and 44 control subjects were screened, and significant increase in incidence of sinus bradycardias (12.5% with OSA vs. 2.3% control, p=0.036) and sinus pause (8.7% with OSA vs. 2.3% control, p<0.001) was noted. Importantly, using long-term monitoring by implanted pacemakers reveals an even higher bradyarrythmias percentages (up to 34%4), suggesting that OSA increase the risk for bradycardia even more dramatically. Not only that OSA increases the prevalence of brayarrythmias, some studies have found that OSA severity is correlated to the extent of bradyarrytmias, with up to 3 times higher incidence of bradycardic arrhythmias in severe OSA patients (compared to milder OSA)5. Such correlation implies that there’s a causal relation between the two, in which OSA promotes bradycardia. The mechanism by which OSA can reduce the heart rate is demonstrated in the presented figure: during OSA, structural changes occur in the airway to obstruct airflow (Resp), and the resulting apnea activates hypoxic reflexes (SaO2 %), which in turn lead to profound elevation in sympathetic nerve activity (SNA) and subsequently elevation of atrial blood pressure (ABP) and decrease of the heart rhythm (ECG). Various studies confirmed that the elevation in vagal tone is the key contributor to the bradyarrythmias, whereas other factors such as sinus node anatomy or artioventrucular conduction are largely intact in OSA patients6. The finding that intravenous atropine administration eliminates the marked sinus arrhythmia and bradyarrhythmias observed in such patients6 supports this hypothesis. 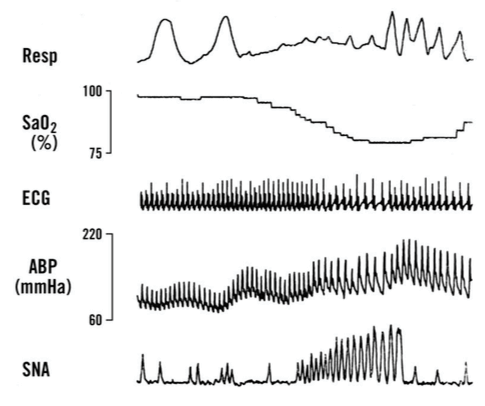 Moreover, mimicking OSA in wakefulness with the Mueller maneuver results in induced bradycardia7, further confirming that the combination between prolonged negative intrathoracic pressures and the resulting hypoxemia is the necessary underlying “mix” i n this unique pathophysiology. The crossover between Bradyarrythmias and OSA is also apparent by the beneficial implications of OSA treatment on bradycardia severity. Specifically, Positive airway pressure (PAP) therapy has been shown to be highly effective in abolition and reduction of bradyarrhythmias. In the Abe study for example, sinus bradycardia (p<0.001) and sinus pauses (P=0.004) were dramatically reduced by CPAP therapy3. 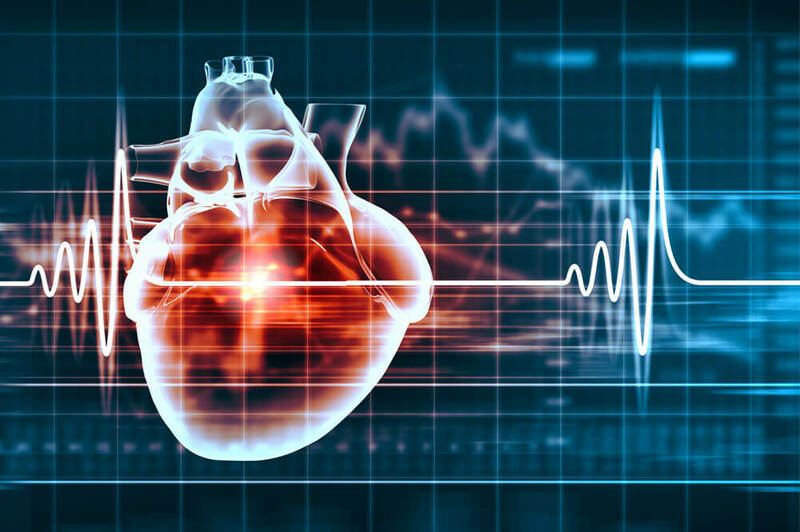 Thus, the current recommendation for physicians for patients with bradyarrhythmias who are at risk for OSA, is to perform overnight polysmonography prior to pacemaker implantation, especially in younger individuals without underlying cardiac disease. Permanent pacemakers should be considered if significant bradyarrhythmia or pauses persist after adequate treatment trial with PAP therapy. Guilleminault, C., Connolly, S. J., & Winkle, R. A. (1983). Cardiac arrhythmia and conduction disturbances during sleep in 400 patients with sleep apnea syndrome. American journal of cardiology, 52(5), 490-494. Fleg, J. L. & Kennedy, H. L. (1982). Cardiac arrhythmias in a healthy elderly population: detection by 24-hour ambulatory electrocardiography. Chest, 81, 302–307. Abe, H., Takahashi, M., Yaegashi, H., Eda, S., Tsunemoto, H., Kamikozawa, M., ... & Ikeda, U. (2010). Efficacy of continuous positive airway pressure on arrhythmias in obstructive sleep apnea patients. Heart and vessels, 25(1), 63-69. Simantirakis, E. N., Schiza, S. I., Marketou, M. E., Chrysostomakis, S. I., Chlouverakis, G. I., Klapsinos, N. C., ... & Vardas, P. E. (2004). Severe bradyarrhythmias in patients with sleep apnoea: the effect of continuous positive airway pressure treatment: a long-term evaluation using an insertable loop recorder. European heart journal, 25(12), 1070-1076. Rossi, V. A., Stradling, J. R., & Kohler, M. (2013). Effects of obstructive sleep apnoea on heart rhythm. European Respiratory Journal, 41(6), 1439-1451. Cutler, M. J., Hamdan, A. L., Hamdan, M. H., Ramaswamy, K., & Smith, M. L. (2002). Sleep apnea: from the nose to the heart. The Journal of the American Board of Family Practice, 15(2), 128-141. Huettner, M., Koehler, U., Nell, C., Kesper, K., Hildebrandt, O., & Grimm, W. (2015). Heart rate response to simulated obstructive apnea while awake predicts bradycardia during spontaneous obstructive sleep apnea. International journal of cardiology, 186, 216-218.